In March 2015, NBCA, in cooperation with the Centers for Disease Control and Prevention (CDC), unveiled its new Stop the Clot, Spread the Word™ public awareness campaign, in recognition of Blood Clot Awareness Month. 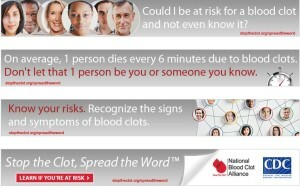 Using several integrated digital communications tools, this Stop the Clot, Spread the Word™ campaign was designed to reach tens of millions of people to help sharpen public awareness about blood clot risk factors, as well as the signs and symptoms of blood clots. Central to the effort of this campaign is our intent to urge people nationwide to ask themselves one potentially life-saving question: Could I be at risk for a blood clot? 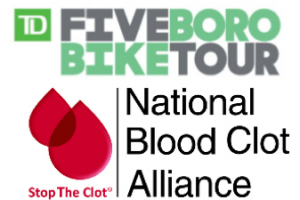 The centerpiece of this campaign involves a new NBCA educational portal designed specifically to provide people with the information they need to know about blood clot risks, signs/symptoms, and prevention. Housed at this portal or campaign landing page are assorted downloadable educational materials, including a risk factors checklist that individuals can use to discuss their risk factors with their healthcare providers or share with family and friends. This new Stop the Clot, Spread the Word™ program is exciting not only because it allows NBCA to amplify important health education messages about blood clots, but also because it evolves NBCA’s previously successful Stop the Clot® efforts to now focus squarely on building widespread public awareness and to also include a strong message connected to social sharing. 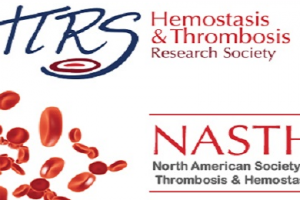 Our aim with this new initiative is two-fold: 1) To raise public awareness and 2) To engage the public in a way that will motivate them to share what they learn with others, or with family and friends who may also be unaware of their blood clot risks. This educational campaign is supported by a nationwide digital marketing effort that has allowed NBCA to reach millions of people with this important information. Among other tactics, this campaign involves the distribution of a Web banner (shown to the right) and digital media press release, both of which helped to promote the campaign landing page and connect the media and the public to the important assets associated with this campaign. Research shows that about 75 percent of people in this country know little or nothing about life-threatening blood clots, but blood clots can be prevented, which makes it crucial for us to raise awareness and, in turn, help to save lives. Experts agree, the first and best way to prevent blood clots is to get people to learn about risk factors that might affect them, and to talk to their health care providers about their potential blood clot risks. This campaign is focused on delivering messages about blood clot risks, and heightening public awareness to the fact that blood clots can affect anyone. Similarly, because blood clots can be treated safely, this campaign also underscores the importance of recognizing blood clot symptoms. 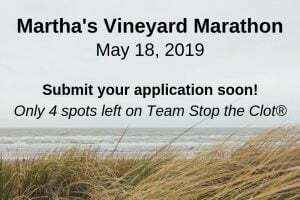 This important Stop the Clot, Spread the Word™ public education campaign is made possible by funding provided to the National Blood Clot Alliance by the Centers for Disease Control and Prevention, under Cooperative Agreement number 1U27DD001153-01. NBCA is extremely grateful to have the opportunity to continue its long-standing partnership with CDC, and proud to expand our work with CDC to now focus our efforts squarely on the crucial task of increasing public awareness to eliminate deaths due to blood clots. For more information about this program, please contact our Department of Communications and Health Marketing. Read our digital media press release here: Stop the Clot, Spread the Word™ Digital Marketing Press Release.